In the 1950s, it was enough for a family to have one breadwinner. In the 1970s and 1980s, families needed two incomes to get ahead. Today, in this world of economic upheaval, even dual-income families can barely make ends meet. Corporate downsizing and restructuring make the future of every job uncertain—and how can you plan for the rest of your life when it’s difficult to plan for next week? But for those lucky few who understand what is causing this tidal wave of economic change, a life of financial security and even prosperity is not only possible, but easy to achieve. 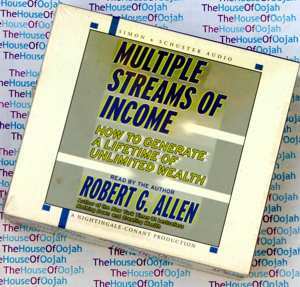 Using Robert G. Allen’s powerful, proven techniques, you can create multiple streams of income—income so stable and secure it can lead to a lifetime of wealth and ease. Whether your goal is to gain extra monthly income or to escape the stress of the rat race altogether, Multiple Streams of Income: How to Generate a Lifetime of Unlimited Wealth can put you on the path to prosperity, peace, and health. When you create multiple streams of income, you are forming a powerful tide of prosperity that can carry you along for a lifetime of fortune and freedom. And you won’t only be helping yourself—friends and family will also prosper from your good fortune. Robert Allen’s’ techniques have made thousands of people into millionaires. Imagine what his amazing wealth-building formulas can do for you. His colossal bestseller Nothing Down established Robert Allen as one of the most influential investment advisors of all time. He has followed that success with three other bestselling books, as well as the audiocassette program The Road to Wealth from Nightingale-Conant.Throughout the 1980s, graduates of his popular nationwide seminars successfully applied his techniques in all 50 states and Canada. Today, there are thousands of millionaires who attribute their success to contact with Robert Allen. A popular talk-show guest, Allen has appeared on hundreds of programs, including “Good Morning America” and “Larry King Live.” He has also been featured in the Wall Street Journal, Newsweek, Barron’s, Money Magazine, and Reader’s Digest.